The image above and below should give you an idea of what my backyard flower garden looks like. 10 years ago I measured my flowerbeds and came to the total of 2,000 square feet. I'm positive that I must have at least 3,500 square feet of flowers now. I live in the Midwestern state of Iowa, and my flowers have to survive harsh Winters, frosty early Springs, hail, thunderstorms, and tornado's during the late Spring, and baking humid Summers. It takes me 1 1/2 hours to walk around and water my garden with a sprinkler, which I have to do every other day during the summer. During the frost warning seasons I've got a stockpile of old bed sheets, jackets, and very large t-shirts that I use to cover and protect them overnight. As you can see in the 2 above images, I have a 2 fences in my backyard. The mowed area between the 2 fences is my dog pen. Sometimes my dogs don't want to listen to me, and decide that a flower might be a great place to do a little digging for a spot to lay down. My old female dog especially likes to roam around in my strawberry bed. When they suddenly become 'deaf' to my warnings, they are ushered to their pen. It's not really a punishment....the dog pen is very wide, and it completely surrounds the boundaries of my property. The tall green plants you see growing at the fence line is Pampas Grass, which also completely surrounds the boundaries of my property. It will grow approximately 3 more feet taller and send out feathery white plumes later this year. Let me introduce you to some of the types of flowers I grow that are perennials. A perennial flower is one that will keep coming back, year after year. They may cost a bit more than the seasonal flowers you can purchase at your nearby garden outlet, but they're worth it, because if you take care of them, they become more beautiful each year. It's the beginning of June at this writing, so I plan to add more photos of my flowers as they bloom this season. This is a favorite of mine, named the Bleeding Heart flower. I can remember as a child that my Grandmother had one, and I always thought the name was peculiar. 7 years ago, my Mother allowed me to dig this plant from her flowerbed, because it wasn't doing well. I nearly killed it myself last year, so I dug it up and put it in a large pot. I'm very happy to see that it likes it's new planter. In the bottom right of these images the light green plant is a varigated hosta starting to unfold. The black you see in the background is my 25x25 foot pond. If you'd like to have a Bleeding Heart for your garden, some are available at Nature Hills Nursery. My honeysuckle flower is actually what you would call a bush or shrub and stands 8 feet tall and 5 feet wide. It certainly didn't start that way. I purchased it in a small pot for $9.95, and it was scrawny, with only 4-5 climbing tendrils. I've had this in my backyard flower garden for 15 years....nearly as long as I've owned my home. The hummingbirds adore visiting this flower and nesting among it's limbs. This Garden Nursery has some beautiful honeysuckle bushes available. I have 3 Clematis in my flowerbeds, all of the purple color. Actually I've got 4, but was too late to get the newest one planted in the backyard last fall. It's still inside my home in a large planter, sitting at a western window and blooming. Two of these I bought, and two I 'snatched'.....(but I asked!) With the current economy many homeowners are losing their homes to foreclosure. My two Clematis vines were dug from acquaintences that experienced this misfortune. You may be able to see a bit of yellow in the bottom right of these images. Those are the first leaves that appeared this spring.......then we had 3 different periods of frost. Thank goodness they survived. Perennial Clematis vines grow in many different colors and bi-colors. I think the Nelly Moser is the most popular, with it's pink two-toned blooms, but I've seen a red Clematis that I've just GOT to have, so this old lady gardener will have to crack open her pocketbook soon. Again, my favorite Flower & Plant Nursery has gorgeous Clematis available for you to check out. I adore the peony, and the red blooms are my favorite variety. I think my camera's flash was activated on the red peony's image, because the true color of it is darker and deeper. Some people don't like the peony because ants love it. You'll often see many ants crawling among the blooms....but I've got a cure for that when I want a few to display in a vase. Just fill your kitchen sink with cool water, turn them bloom side down, and let the blooms sit in the water for awhile, the ants will drown. Shake off the excess water, and arrange them in a vase. Did you know that the 15th C. Christian name for the Peony was the Pentecost Rose? The bloom does resemble a rose, but the peony's bloom is much much larger. I found 1 spot online that still has the Peony flower available, most I checked have already sold out. There's a 'Life Time Peony Collection' of 5 Different Colored Peony Plants. Ooooo, my poor Phlox flowers are just about done blooming :( You can tell that by the empty stems on the blooms. They are one of the first blooms I see in my flowerbeds each Spring, and they have very full flower heads. The type I have are Wild Woodland Phlox, and I 'aquired' them by digging up a few in a highway ditch 3 years ago. Each year this flower will seed itself and spread. I still have a garbage bag full of seeds from last year to spread in places of my backyard and frontyard......which I'll do in the Summer at the same time my current plants are seeding. See all the Different Varieties of Phlox Flowers that are available! My weigela bush is only 3 years old. I just about killed it the first year, as I bought it at a yard sale for $5 and didn't have the time to plant it the first year. The weather snuck up on me too fast, so the poor thing sat in my flowerbed in it's pot for the winter. This is the first weigela I've ever had, and it's getting 'leggy', so I'm going to have to read up on how to prune or trim it.......but I DO love the blooms! It's a prolific bloomer, and I was very pleased last year to see that it bloomed 2 times! The first time is late May - early June, and the second time, if I remember right, will be in September. There are 15 Different Weigela varieties available at my favorite nursery. I have 2 rhododendron shrubs that were a Mother's Day choice 2 years ago. I thought when I picked them out that they would bloom purple. I've got a very large planter that I want to transfer them to this fall, because I think they look scrawny. They are planted in a flowerbed that also has Wisteria, Lillies, and a large Rose bush, so I am going to dig them up this Fall and put them in a very large planter. That way I'll be able to control the Ph level better, because I know they like an acidic soil.......so they'll be healthier and hopefully bloom purple next year. In the 'rhododendron flower bloom 1' image, the other plants growing in the picture are yellow spotted Lillies that bloom upside down and are over 6 feet tall when mature. I'll insert the lilly images when they bloom! If you'd like to try your hand at growing rhododendron's in your flowerbeds, check out these beauties. Pictures of Flowers, the continuing page of what's currently blooming in my Iowa flower garden. I've gotten really into native plant gardening lately, because I want my gardening to have as positive an impact on the local ecosystems as possible, supporting native birds and other wildlife. Some of the flowers you highlight here are great native options that I think are under-utilized. 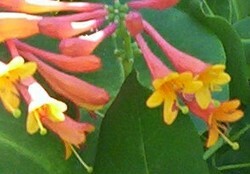 The red-blooming honeysuckle, Lonicera sempervirens, is really striking...it's native to much of the eastern US and I think it is really dramatic and visually pleasing relative to the plainer, introduced yellow and white honeysuckles. I also LOVE Phlox, and there are SO many of them, all but 1 species native to North America! They are easy to grow and my favorite aspect of them is how aromatic they are. They are one of my favorite floral smells, and some can tolerate a good amount of shade. Why thank you Puerdycat! My spelling...purdycat LOL. I'll second that! My seeds go everywhere and I find out what they like best. You have a lovely, lovely garden! Aaaaa, but Cace, that's the fun of it! My favorite quote is 'there are no mistakes in the garden, only experiments'. Believe me, you DO remember by trial and error what works, and what didn't turn out so great, LOL. What a beautiful garden! I love flowers, but am not very good at growing them. You obviously put a lot of time and care into yours. Thank you Ladymermaid! Not too bad for an amateur photographer with a dinky little camera? Your flower garden is so beautiful. The weigela is a member of the Caprifoliaceae species. I believe my bush is the Weigela florida Minuet, but I'm not sure if it's available in France. Don't You Love Bright Yellow Sunflowers? Sunflowers are so colorful, easy to grow, and don't need any special treatment.